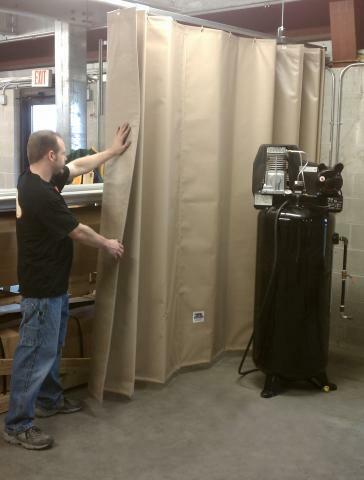 Reduce Harmful Noises with Goff’s Custom Made Industrial Sound Curtains. Unique Fan Folding Design allows for complete flexibility in Sound Control! Comes complete with Track & Roller Mounting Hardware in 3 Mounting Options: Ceiling, Wall, or Free Standing. Goff’s Sound Curtains are designed for to reduce industrial strength high frequency noises. Sound Curtains utlize the same track and roller style hadware as our standard curtains. The universal track system allows for fac mounting, supspend mounting, or flush mounting. Just supply your dimensions and we’ll make sure you get the proper hardware for your application. For more info about Goff’s Hardware Click Here! The Sound Curtain Valance is constructed with the same Viscoelastic Acoustic Damper as the Sound Curtains and can be custom made to fit any opening or pitch. 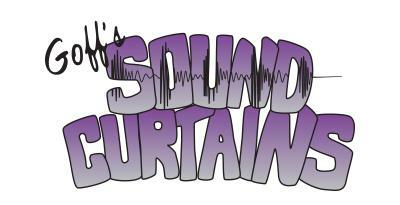 Goff’s Sound Curtains are custom made in heights up to 25’* and in any width and layout. *Mutiple curtain panels can be attached to accomodte applications over 25′ high.